This species is accepted, and its native range is Bangladesh to W. Thailand. A non-climbing colony forming rattan; stem erect, strong, 3 - 5 m long, 4-6 cm in diameter, annulate, internodes about 20 cm long. Leaves arching, 2 - 2.5 m long; leafsheath, petiole and rachis covered with thick, black, subulate, seriate to pectinate, 1 - 4 cm long, black spines; leaflets 40 - 80 cm long, equidistant, deep green above, whitish beneath, spiny at margins, acuminate to thinly bristly at apices, prominently bristly on upper and lower midnerve. Inflorescences interfoliar, to 2 m long, pendulous, much attenuate towards apex; peduncle smooth, compressed, green; bracts 20 - 30 cm long, lacerate at upper part, thickly spiny below; male rachillae scorpioid; male flowers distichous, calyx cupular, 3-lobed, leathery, petals acute, valvate; filaments longer than corolla; anthers linear, exerted; pistillode angular, with 3 abortive carpels united up to the middle. Female flowers and fruits not seen in cultivated plants. It is understood from the cultivated plants that this species prefers to grow on moist soil. BURMA, INDOCHINA, MALAY PENINSULA. 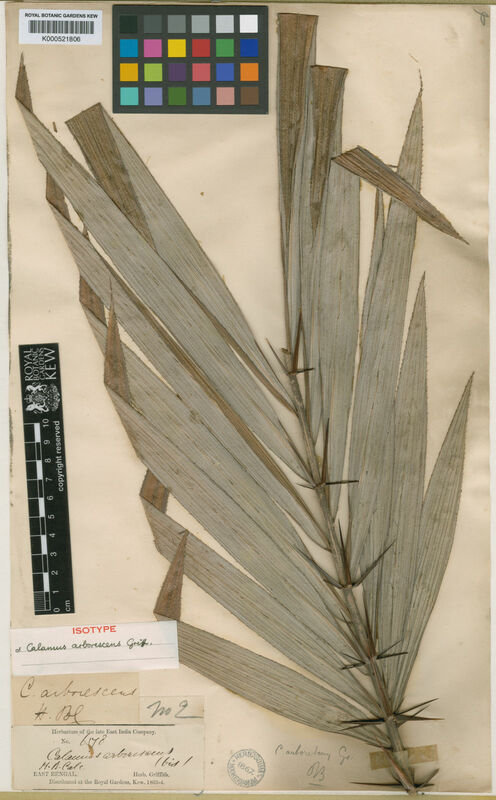 Although this species has no natural distribution in India, it is grown as ornamental palms in pots or in the garden chiefly for its arborescent habit and glossy leaves. Introduced in the Indian Botanic Garden, Howrah in 1810 from Pegu, Burma. Now the Indian Botanic Garden has several large colonies of this species growing along the ponds and marshy areas. Dried stem is not durable and cannot be bent easily and is therefore unsuitable for making furniture frames. The mature stem can be used as sticks, poles or as roof support in thatched huts. The dried stem can also be used as handles of hatchets etc.